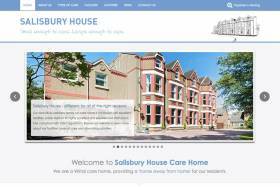 We are pleased to launch our new website www.salisburyhousewirral.co.uk. We hope you enjoy looking through the photographs and spot a few familiar faces, our residents…or should I say models were involved in the design of the website and thoroughly enjoyed their photo shoots! We have a Salisbury House News Page where we will post up and coming events and photographs of our days out and special events so please visit regularly. We also plan to launch a Facebook page soon where families can see photos and updates of all Salisbury House’s activities, if you have any ideas or thoughts on what could be included on the webpages please see Richard and Joanne, Activities Coordinators. We are also introducing new activities into our programme including ‘Computer Hour’ were we will be familiarising our residents with the World Wide Web, through the internet the residents will have the chance to reminisce on old times, look at photographs and video clips of times gone by and also keep up to date on national and local news and events. The computer will be linked to the lounge TV for all to see.